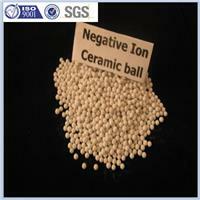 Negative ion ceramic ball has smooth surface without dust and precipitates while dipping in water. Negative ion ceramic ball is made from natural stones through the nanometer processing which can be continuously produced negative ions, widely used in industry, food industry, water treatment, home and the environment clean. Anion ball is also called anion ceramic ball. Its production materials is high active composite powder of anion and ceramic and other silicate materials, after high temperature firing, anion balls are completed. Due to active anion and ceramic composite powder, in each anion ball there are thousands of pairs of electrodes. At the moment of touching water, there will be a electrolysis by anion balls, which will make hydrogen ions turn to hydrogen and leave water, it will make the water be alkalescent, PH is 7.4-7.6. Because of infrared function, macromolecule group of water will turn to micromolecule group, which will make dissolving power of water better and seepage force and will bring hydroxyl anions. If people drink such water for long time, body’s PH value will be adjusted. Such water can eliminate tire of body, improve microcirculation and increase body’s health. Anion ball can make moisture molecular group smaller, it can permeate cell membrane easily, which will increase cytoactive and body immunity. It can eliminate peculiar smell of water and residual chlorine, it also can perish harmful substance and carcinogen. Water with alkalescence contribute to human body’s acid-base balance and nutrient balance. Anion ball is rich in mineral substances of Ca, Mg, Na, K which are needed by human body. High conductivity, low redox potential. It promotes digestion and prevents senium, makes people much healthier. Anion effects and functions will not change in sunshine, temperature and pressure. 1) By adding negative ions ceramic ball in drinking water, the water can kill bacteria,increase dissolved oxygen, and activate water. Negative ion ceramic ball can also be used for water heaters in bathrooms to make oxygen-rich water and increase air negative ion concentration. 2) Negative ion ceramic ball has smooth surface,without dust, so it can be used for room decoration to change the air quality, and increase the negative ion content and provent "Air conditioning disease" and the "computer syndrome." 3) Negative ion ceramic ball can be used in the car, to eliminate the car smell and clean the air. Should wash with clean water for two times in advance, then can be directly used for drinking water.